Now I know that summer has passed us by and we are well and truly into Autumn / Winter now, however many people jet off to sunnier climes at this time of year to get a rest bite from the more changeable, cold weather we are blessed with here. If that’s you, then you may wish to take something to ward off those pesky biting bugs that just love to have a nibble when you’re dining out at night. My husband is one of them and if mosquitos head for anyone it’s him. He obviously tastes too good! 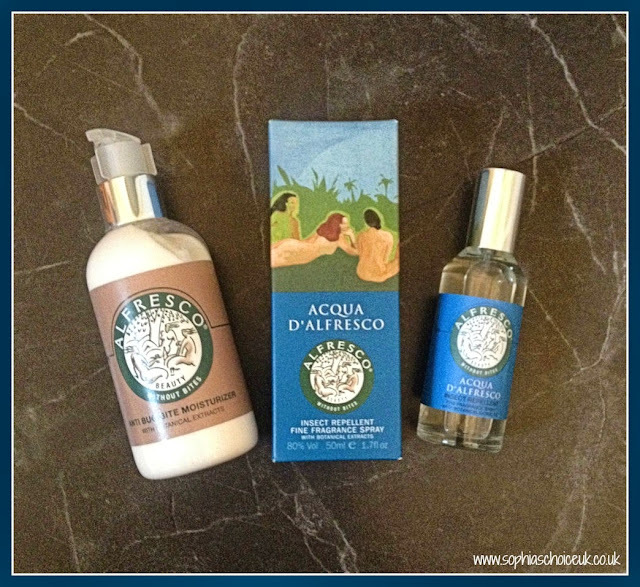 Alfresco kindly sent me one of their Anti Bug Bite Moisturisers and one of their Insect Repellent Fine Fragrance Sprays, Acqua D’Alfresco to try out. Both products were developed by Sarah-Lou Morris who describes herself as “a 5 star meal to insects”! After spending many years experimenting with essential oils and lotions she finally came up with a fragrance blend which she loved and bugs hated. Sarah-Lou excitedly took this formula to an apothecary and formed an alliance with a very old established English family run factory who produced the quality Sarah-Lou wanted to sell to the world. And Alfresco was born. With a fragrance spray and body lotion to choose from these products are made as naturally as possible and can be used on children right up to adults. The fragrance is floral and spicy and described by Alfresco as Floriental. The fragrance spray can be used as a perfume in its own right as well as an insect repellent spray and will certainly appeal to those who like a strong scent. For me it was just too strong, however I don’t wear perfumes much and when I do they tend to be more citrusy blends than floral, musky, spicy ones. I wasn’t expecting the fragrance to be quite so strong however there are a lot of people that this type of product would really appeal to. Ingredients: Alcohol Denat., Aqua (water), Parfum (fragrance), Diisopropyl Adipate, Benzyl Alcohol, Benzyl Benzoate, Benzyl Salicylate, Cinnamyl Alcohol, Cinnamal, Citral, Citronellol, Coumarin, Eugenol, Geraniol, Isoeugenol, Limonene, Linalool, Alpha Isomethyl Ionone, Evernia Prunastri (oakmoss) extract. Includes: Citrus Aurantium Dulcis (orange) oil, Cinnamomum Zeylancium Bark Oil, Pogostemon Cablin (Patachouli) Oil, Melissa Officinalls Leaf Oil. The anti-bug bite moisturiser is more subtle in its fragrance so would suit those who weren’t looking for a long lasting fragrance spray but wanting the same bug preventing effect. With Cinnamon Leaf, Patchouli, Cedarwood oils to repel insects, this moisturiser when reapplied every 3 hours should keep you bite free on your next holiday . Ingredients: Aqua (water), Isopropyl Palmitate, Caprylic/Capric, Triglyceride, Stearic Acid, Cetearyl Alcohol, Triethanolamine, Parfum (Fragrance), Cinnamomum zeylanicum (Cinnamon) leaf oil, Pogostermon cablin (Patchouli) oil, Juniperus virginiana (cedarwood) oil, Phenoxyethanol, Dimethicone, Benzophenone-3, Ethylhexylglycerin, Disodium EDTA, Ceteareth-20, Benzyl Salicylate, Limonene, Linalool. We go camping every year and in the evenings mozzies and midgies are rife so although I’m not sure I’m in love with the fragrance I may well be packing these 2 products to try out particularly on my feet. Here’s hoping they end up bite free. 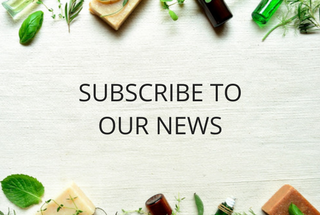 If you’d like to find out more about Alfresco’s range of natural anti-bug products, then pop across to their website for a browse. You will also find them on Facebook and Twitter. 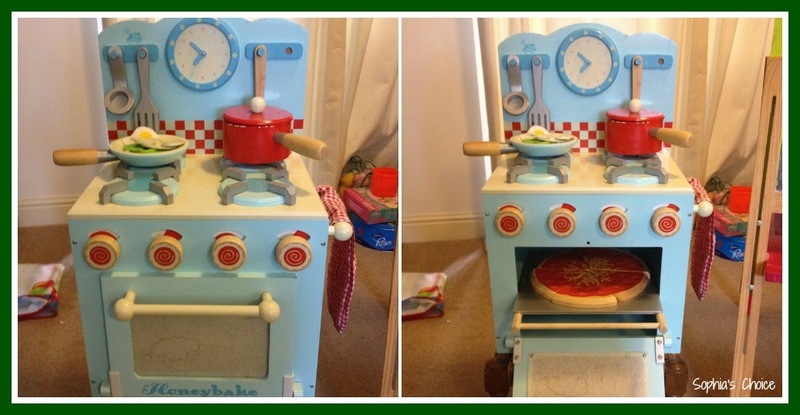 Have any of you tried the Alfresco range? Let me know in the comments if you have. Disclaimer: I was sent an Alfresco Acqua D’Alfresco Insect Repellent Fine Fragrance Spray and a Anti Bug Bite Moisturiser to try out. All opinions are my own honest thoughts and feeling on the products I tried. This year has been a year for making connections, for meeting people. I have spent a lot of time over the past 2 years whilst writing this blog, connecting with so many amazing people over Twitter, and 2014 has finally been the year when I have met some of them. One such person is Tracey Robinson from Vert PR. 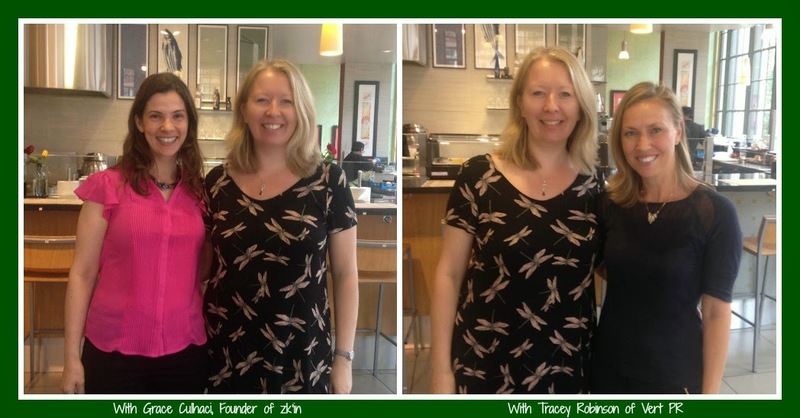 We only live 2 counties away from each other here in the West Country, however it took the fabulous Organic Beauty Week at London’s Wholefoods Kensington to finally bring us together in September and I also had the honour of meeting Grace Culhaci the founder of zk’in Organic Skincare at the same time, who was launching her amazing certified organic skincare range in the UK that week. We spent many an hour chatting and I have to say it was like catching up with old friends. The time whizzed by and if I’m honest I could have chatted all day! Grace is one of those women you meet who glows. She has an amazing smile and her generous nature makes you feel at ease straight away. 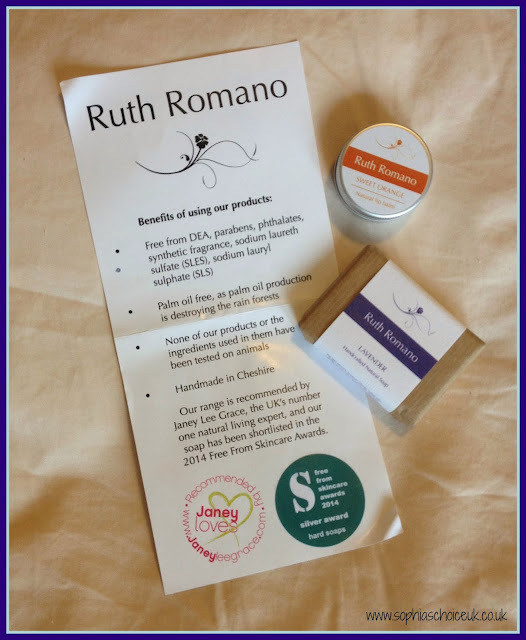 Her passion for her certified organic skincare range is evident from the moment she shares with you the many benefits they bring and some of the unusual ingredients they contain. Grace, like many others was guided to change her life when she had her first daughter. She developed a skin condition in pregnancy which made her take a long hard look at the products she was using. Carcinogens and toxic ingredients in even those products which professed to be natural inspired Grace to research, study and learn to create her own organic alternatives and through their use her skin condition cleared. 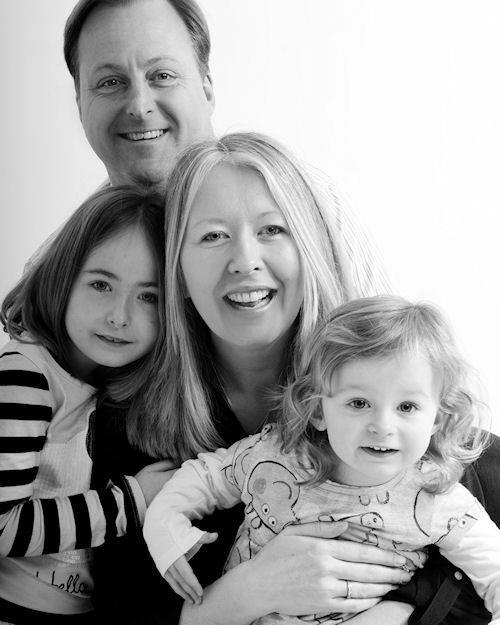 However, during her second pregnancy Grace was to be diagnosed with an inoperable tumour on her optic nerve which left undiagnosed for many years had affected her vision in the right eye. This life changing moment made Grace focus her attention on creating and living a healthy, organic lifestyle with a vitamin B17 nutritional program. This and the use of her pure skincare products meant that she now lives, as she puts it ”a beautiful, pain free life”. I was given the opportunity to try out some of the zk’in range and I have to say that my skin went through quite a few weeks of positive change. I’ve only had this with 2 other skincare ranges so far; AEOS and Live Native. More on that later. Zero tolerance to unnatural ingredients. They choose instead to have a 100% natural preservative system. Zero tolerance to unsustainability; all packaging complies with food grade standards and is BPA free. 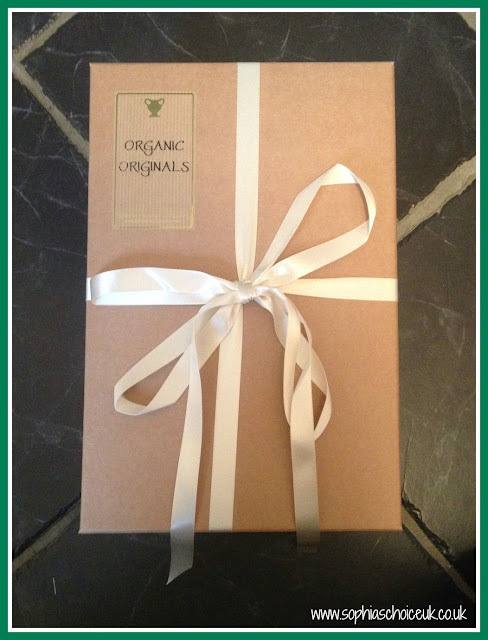 The packaging is recyclable and sustainable. Zero unsustainable ingredients and business practices. Zero tolerance to animal cruelty; no testing of products or ingredients on animals, no selling to markets that require compulsory animal testing and the range is proudly vegan. Zero tolerance to dishonest marketing; no photo shopping of images of women used in their promotional literature. Remember this is honest beauty. Zero petrochecmicals, zero parabens and sulphates, zero GMO ingredients, zero nano particles. I was given products from their oily / combination skin range to try; the purifying cleansing gel, clear skin toner, rebalancing lotion and then the line smoothing serum and clarifying exfoliator. I began with the main 3 products from the oily / combination range for the first few weeks to get my skin used to the new regime. I was glad I did, as my skin went through a type of cleansing. Our skin is our largest organ and it is a great detoxifier. The zk’in range uses healing Aloe Vera at its core, being the first ingredient on each of the product lists. I found that my skin started to shift out toxicity quite quickly after starting with the new products and I erupted in spots around my jaw line which is a key area for me if my skin decides to clear out. Now I could have decided to stop there and not continue on, however knowing that my skin was taking this opportunity to throw out some toxicity I persevered and after about 4 weeks of using the cleanser, toner and rebalancing lotion my skin settled again to reveal smoother, clearer, smaller pored skin. Wow, I was impressed. 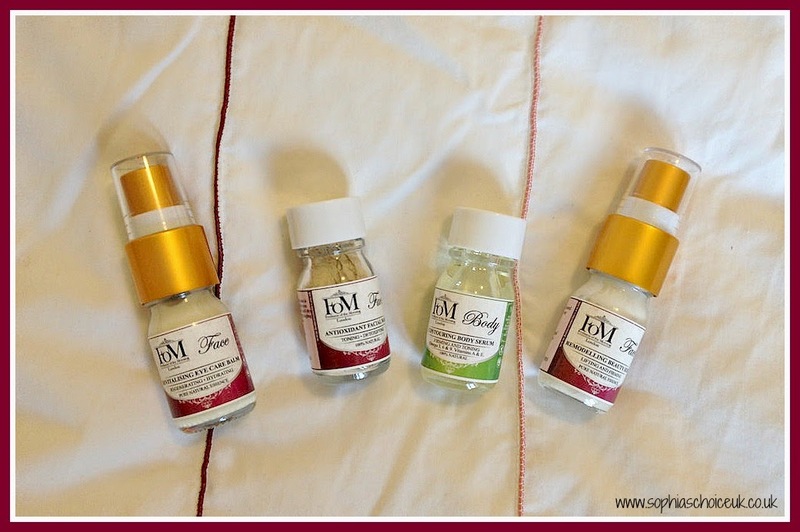 I then started to introduce the line smoothing serum and once a week the clarifying exfoliator. I have continued on with this regime for about 7-8 weeks now and my skin is calm, clear and much less shiny in the t-zone area. I’m really impressed. 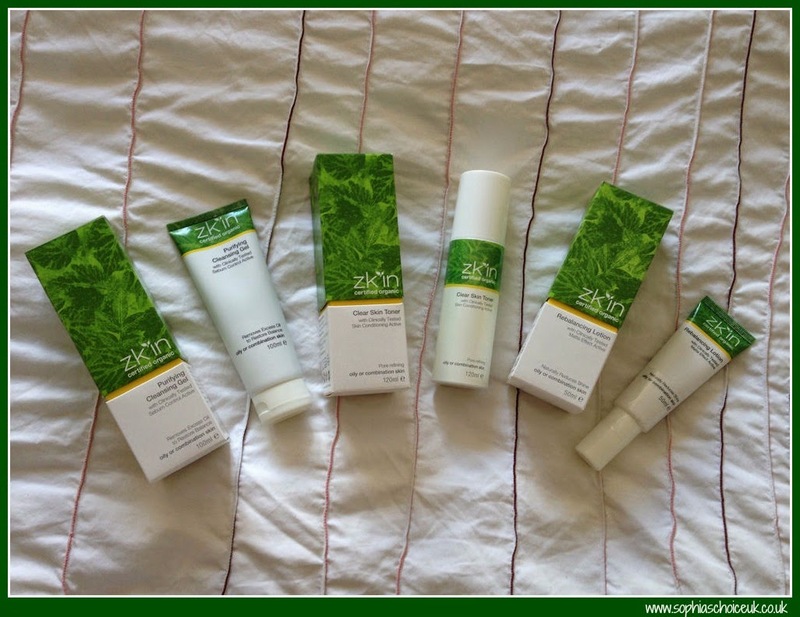 I have only ever had this change with two other skincare ranges AEOS which uses biodynamic ingredients and Live Native who like zk’in only use a 100% natural preservative system. My skin seems to love the purity of these ranges. Purifying Cleansing Gel – This is an oil free gel which uses clinically proven Quillaya Bark Extract to help reduce shine. It doesn’t foam which is a shame, but it gently cleanses the skin leaving it feeling clean and matt. 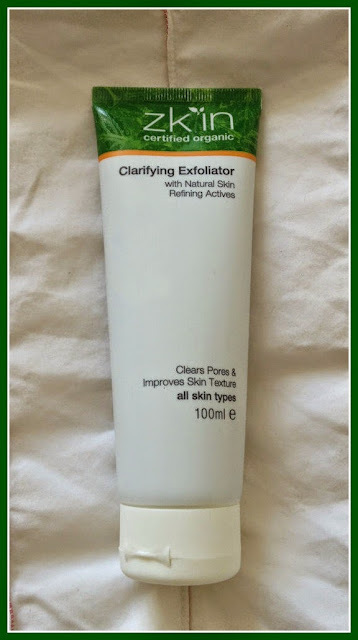 Clean Skin Toner – This light toner was lovely to use. With astringent witch hazel and anti-acne Willow Bark, this fresh toner was effective yet gentle. My only criticism would be that I’d love to see it as a spray toner. I love to spritz my toners onto my face – I’m lazy ! 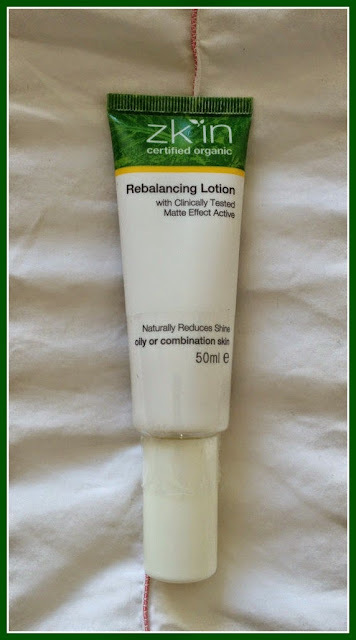 Rebalancing Lotion – This has a lovely citrusy smell and sinks well into the skin leaving it matt and ready for make-up. It features EPS Seamat to mattify shine within one hour of use. My skin loved it and stayed matt pretty much all day which is normally unheard of! 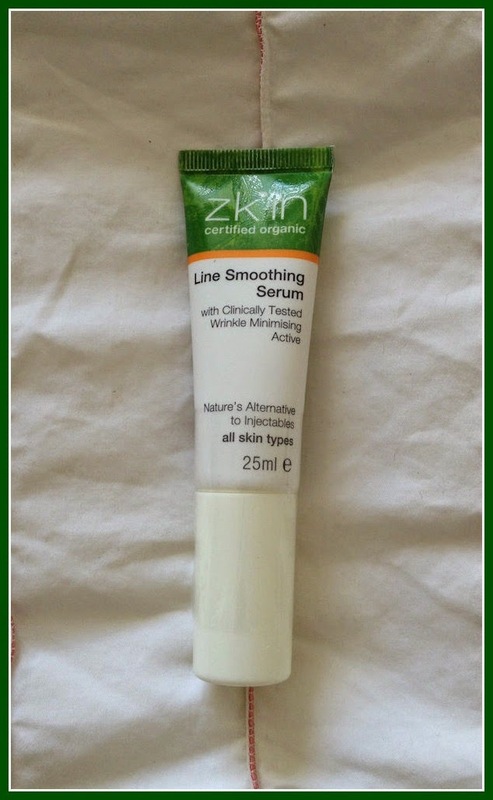 Line Smoothing Serum – This beautifully light skin serum smells of vanilla and sinks beautifully into the skin. It uses clinically proven active Galuline Expression which temporarily blocks the muscular contractions that contribute to expression lines. I can’t say I noticed much difference with this however, I am blessed with few lines even at my now 42 years young. Oily skin does have its benefits in the end ! Clarifying Exfoliator – This exfoliator uses coffee beans and colloidal oatmeal to remove congestion, refine pores and improve clarity. I preferred to use this almost like a mask which is recommended to drier skins. It was quite coarse in its texture and smelt amazing. I don’t like to drink coffee but the smell is fabulous. 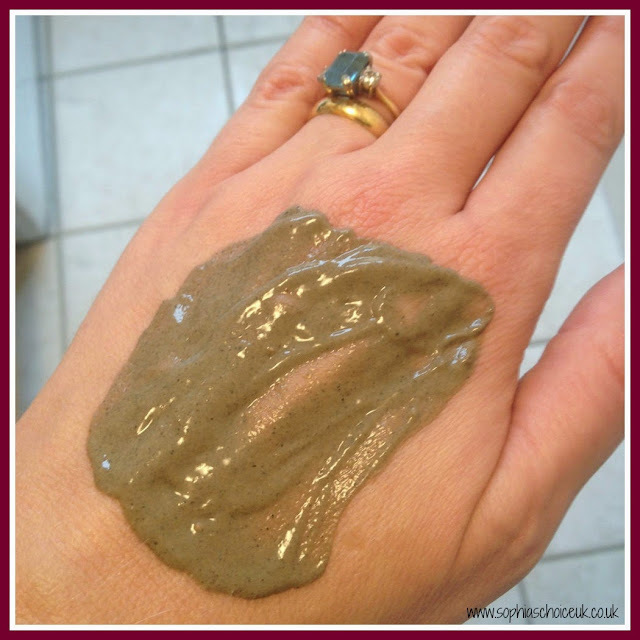 This exfoliator smells of freshly brewed coffee – delicious. 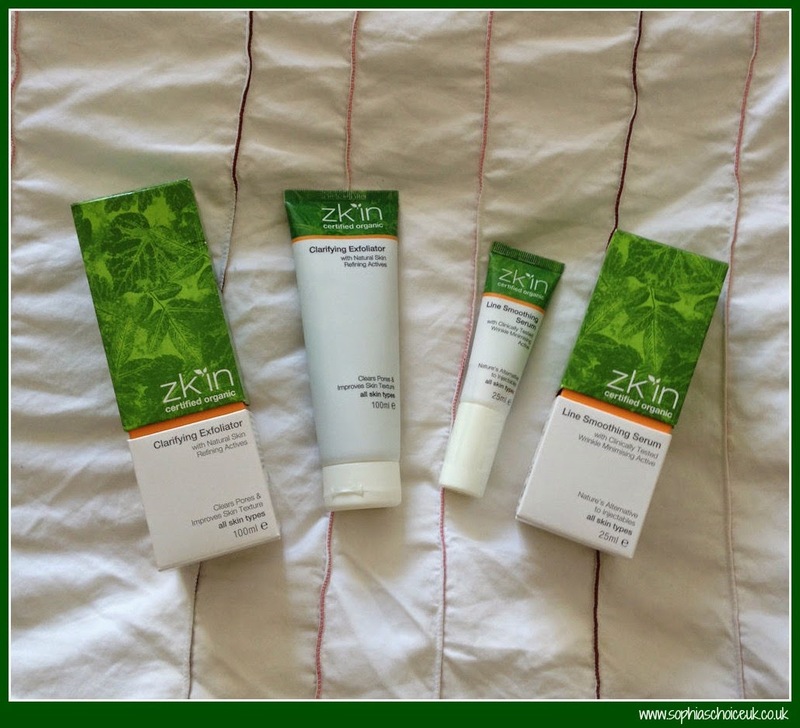 Overall I’m really impressed with zk’in’s COSMOS certified skincare range. It’s well thought out, effective yet gentle and with a 100% natural preservative system you really can’t go wrong with this one. The range extends to normal to dry skin and sensitive skin and several of the products transcend all skin types. 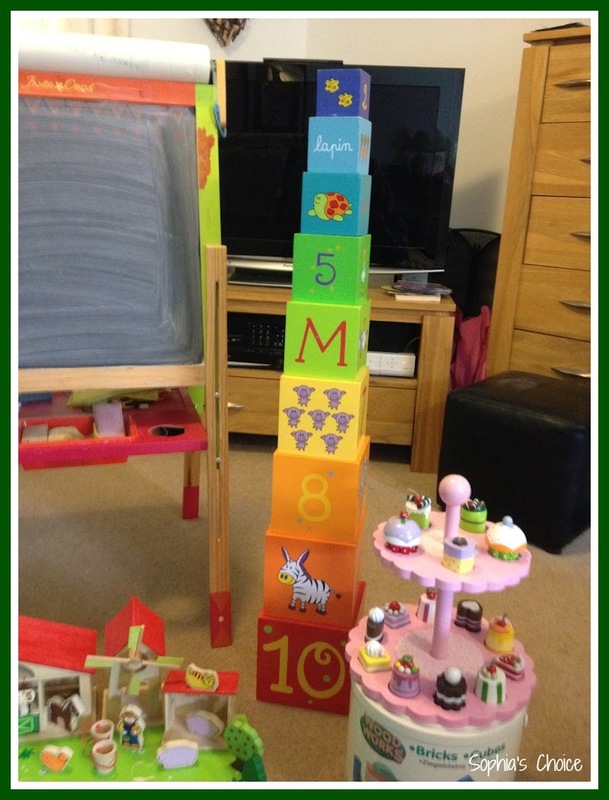 The range is reasonably priced making it accessible to most budgets which was one of Grace’s wants. Good quality skincare shouldn’t need to cost the earth. If you’d like to find out more about this great skincare range then pop across to the zk’in website for more information. In the UK you can currently purchase zk’in at Xynergy and Love Lula. Have you come across, or used any of the zk’in certified organic skincare range? If so, do share your thoughts below. Disclaimer: I was given a Purifying Cleansing Gel, Clear Skin Toner, Clarifying Exfoliator, Line Smoothing Serum and the Rebalancing Lotion to try out for review. All opinions given are my own honest thoughts and feelings on the products I used. UPDATE: zk'in is no longer available to buy direct from the UK. 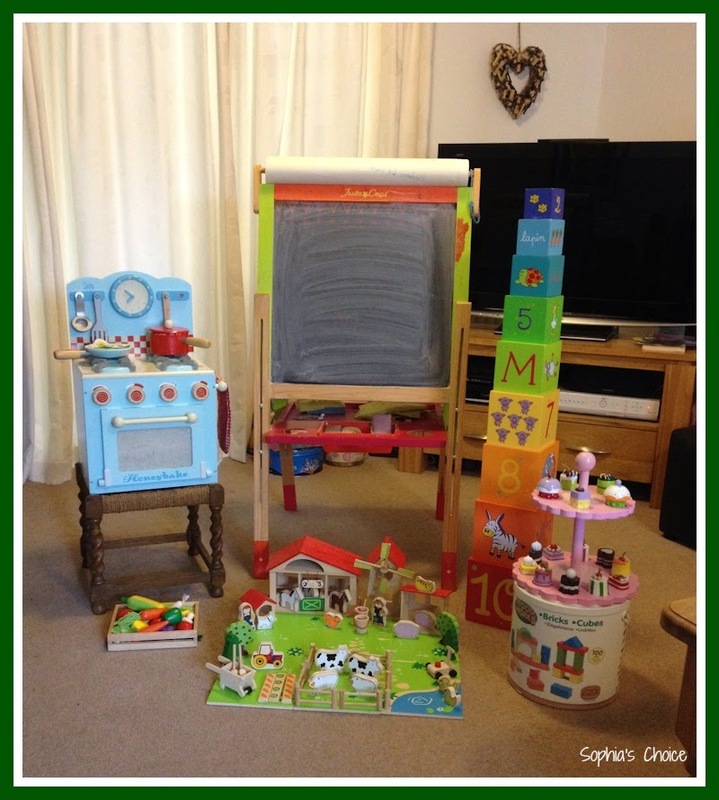 It’s always nice to be able to bring you a competition giveaway and with Christmas only 6 weeks away (yes, really ! ), this giveaway may just suit someone special on your Christmas list. Lets’ hope so. Amphora Aromatics began life in 1984 in Bristol and I remember using their aromatherapy base and essential oils in my holistic massage treatments when I had my practice before having my children. Combining traditional formulas with exotic herbs and oils, their philosophy is to create high quality products at very competitive prices. As time goes by, I love being able to connect with like-minded people with similar or the same values that I have. Over the two years that I have been writing this blog I have connected with some amazing people and brands. I feel blessed to have found such an array of natural products to try out and share with you, my readers. I’m a pretty uncomplicated person at heart, so I tend to be drawn to products which have simplicity at their core. It’s all very well have fancy ingredients and names but if the product doesn’t do what it’s supposed to then for me anyway, it’s not worthy of my precious time. Some of the best natural products I’ve used, have had the shortest ingredients lists and have changed the way my skin feels and looks. That’s one of the things that drew me to Ruth Romano. Founded by Ruth Cartwright, Ruth Romano’s products have simplicity at their core. I was kindly sent one of their Lavender soaps and orange lip balms to try out and I have to say I loved both. 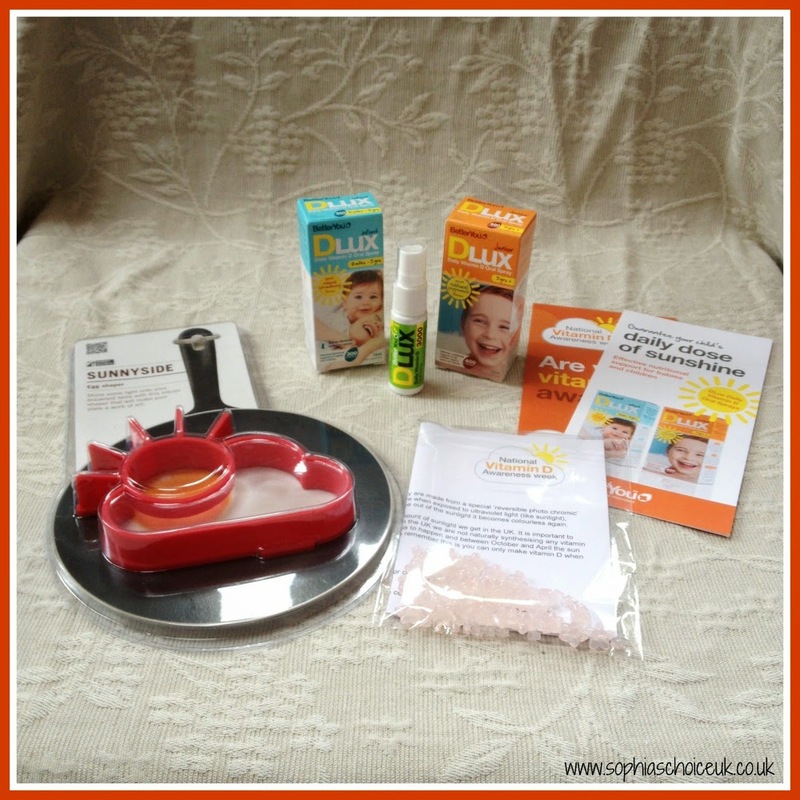 This week is National Vitamin D Awareness Week and BetterYou kindly sent me a Vitamin D pack with lots of information on this important nutrient including samples of their 3,000iu adult spray, 400iu junior spray and 300iu infant spray. In addition, there were some great sunny beads and a sunshine egg cooker. More on those later. We all know that vitamin D is important for strong bones and healthy teeth but did you know that it is also integral to a robust immune system? It is known as the sunshine vitamin as our bodies can synthesise this important nutrient from the sun’s UVB rays. This is the best way to top up your reserves, however in the UK that can be hard to do particularly from October to April. The UK is one of the cloudiest counties in the industrialised world, so making sure we top up our supplies is integral to our health. By now you will probably have realised that as well as being passionate about what we put on to our bodies, I’m just as passionate about what we put into our bodies; perhaps more so. I’m just about to begin my second year studying naturopathic nutrition and as I learn more, I come to understand why so many of us suffer with the array of conditions which tend to afflict so many people. We have become a culture of “quick fixers” and this has led us to eat on the run, eat a heavily processed diet, drink less or in some cases no water, not take enough exercise and then wonder why this amazing body we have been blessed with starts to fail us. You cannot expect your body to keep up and constantly heal itself if you fail to nourish it properly. In short we are and reflect our cells. If we are not nourished on a cellular level then this will eventually show in our bodies. Whether that be inflammation in the joints or skin, acute illnesses which become chronic ones, depression; the list goes on. It’s rare that you come across a company these days whose main aim isn’t predominantly driven by profit. We all know we’re in business to make ourselves and others a living, however it’s so refreshing when you come across a company whose core values are based on the search for solutions for skin problems which use natural ingredients and that this is ultimately their main motivation. A company like this definitely catch my attention. FoM London (or Fresh of the Morning London) is one such company and they exhibited earlier this year at Natural Organic Products Europe. I sadly was unable to go due to being poorly. Zaga from FoM contacted me after the event and asked if I’d be interested in trying out some of their range. She kindly sent me a trial size of their Remodelling Beauty Serum, Revitalising Eye Care Balm, Antioxidant Facial Mask and their Contouring Body Serum. The first thing I noticed was the stylish packaging and attention to detail. I personally buy first with my eyes and I believe how a product looks has a big bearing on whether someone will want to find out more or simply move on. FoM have a perfectly formed range of skin and bodycare products in addition to their men’s range section too. Ana from Ana Goes Green reviewed their Bath Oil and loved it and I have to say that I have nothing but good to say about this range too. It’s always more difficult to get a true gauge of how a skincare range performs just from trial sizes, however from what I tried I found my skin liked the products. This is a light, easily absorbed cream serum which smells gorgeous. With rosewater, olive squalene, brown algae, acmella spilanthes, ginseng, gotu kola, olive leaf, and lupin proteins, this serum is full of skin loving ingredients. I used this at night with the eye balm and found it worked well at nourishing my skin. The serum can be used under your normal moisturiser. Aqua, Rosa Damascena, Squalane, Glycerine, Cetearyl Alcohol (and) Polysorbate 60 Caprylic/Capric Triglyceride (and) Spilanthes Acmella Flower Extract, Prunus dulcis and Panax Ginseng extract and Ginkgo Biloba extract and Centella Asiatica extract and Olea Europea extract, Fucus Vesiculosis, Equisetum arvense,Tocopherol, Panthenol,Hydrolyzed Lupine Protein,Aqua Yeast Extract, Avena Sativa, Phenoxyethanol (and) Capryl Glycol, Xanthan Gum, *parfum (100% natural) *citral, geraniol, citronellol, limonene (naturally occurring inessential oils). This is described as a balm however it’s more of a light cream than a balm. I see balms as butter and oil based, firmer in texture without water. I notice though that there are a few companies who describe their products as a balm when it’s more of a creamy texture. This eye balm is fragrance free and sinks into the skin well. I used this at night and it left my delicate eye area beautifully hydrated and nourished. This eye balm claims to reduce puffiness, dark circles and fine lines around your eyes. With botanical extracts, antioxidants and Vitamins A and B, this rich treatment is specifically formulated to counter moisture loss, collagen breakdown, and free radical damage. It nourishes and hydrates the delicate eye area and also helps to reduce redness and puffiness around the eyes. (25g) Rosa Damascena water, Aqua, Prunus Dulcis, Oryza sativa, Cetearyl Alcohol and Polysorbate 60, Olea Europea (Olive) Fruit Oil, Glycerine, Squalane, Panthenol, Tocopherol, Camellia sinensis leaf extract, Rosa Rubiginosa, Hydrolyzed Lupine Protein, Euphrasia Officinalis Extract, Eleutherococcus senticosus root extract, Centella asiatica extract, Equisetum Arvense, Hamamelis virginiana, Avena Sativa, Immondsia chinensis, Daucus carrota, Rosmarinus officinalis, Cetyl Alcohol, Caryocar brasiliense, Cucumis sativis, Phenoxyethanol (and) Capryl Glycol. This 100% natural exfoliating and detoxifying mask provides a gentle exfoliation to help reveal a clearer, younger and brighter complexion. It reminds me of the type of face mask I used to use as a teenager however with this one you mix it yourself. It can also be used as an exfoliator too. It is fragrance free and you use water to mix it into a paste. I think you could also mix it with floral waters like rose to add an extra nourishing quality to the mask. The mask works to target age spots and reduce the appearance of fine lines and is suitable for normal, combination and oily or acne prone skin. It left my skin super soft and hydrated. The mask does eventually dry, so if you prefer you can take it off before this process happens. With Vitamin C, Chamomile, Lavender, Olive Leaf, Rosehip this will certainly nourish tired and lacklustre skin. Bentonite, Olea Europea, Camellia Sinensis, Rosa Canina, Spirula, Maris Limus, Zea Mays, Rosa Damascena, Lavandula Angustifolia, Matricaria Recutita, Iris Florentina, Ascorbic Acid. This body serum smells amazing ! I used this sample size up in one application and was gutted I had no more to try. I can’t comment on how it performs over time, but based on the one application I had from it, it smells citrusy and is a perfect body pick me up. With olive squalane, nettle extract, marshmallow extract, rooibos and horse chestnut, this is yet another product packed with skin loving ingredients. Prunus Dulcis, Oryza Sativa, Helianthus Annus, Organic Stellaria media, Helianthus annuus, Squalane, Prunus dulcis and Urtica Dioica leaf extract and Althaea officinalis root extract and Aspalathus linearis leaf extract, Organic Aesculus hippocastanum, Helianthus annuus, Rosa Rubiginosa, Mauritia flexuosa, *Pure blend of essential oils, Tocopherol, *linalool, limonene, citral, geraniol, cinnamyl alcohol, eugenol, cinamal, coumarin, benzyl benzoate (naturally occurring in essential oils). FoM London’s packaging is all recyclable and their products are made in small batches in the UK. 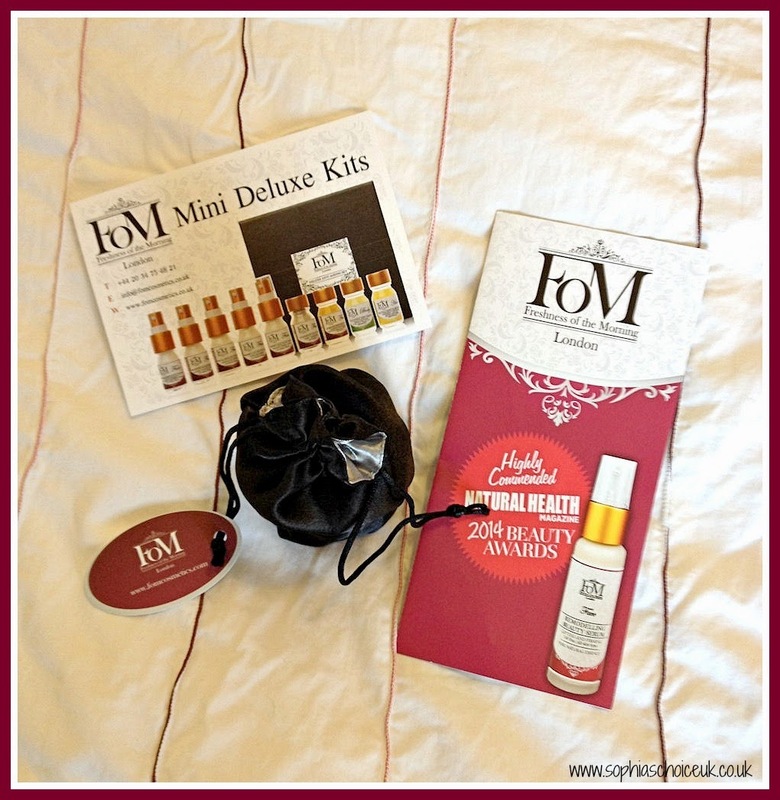 You can find out more about FoM London’s great skin and bodycare range on their website. Have any of you tried FoM London? Do leave me a comment if you have. I’d love to know what you think. Disclaimer: I was kindly sent a trial size of FoM London’s Beauty Serum, Eye Care Balm, Antioxidant Mask and Contouring Body Serum to try out. All thoughts, feelings and opinions are my own, no one else’s. It’s that time of the year again when the weather changes, the kids have returned to school and nursery and all of a sudden tummy bugs and stomach upsets rear their ugly head once more! 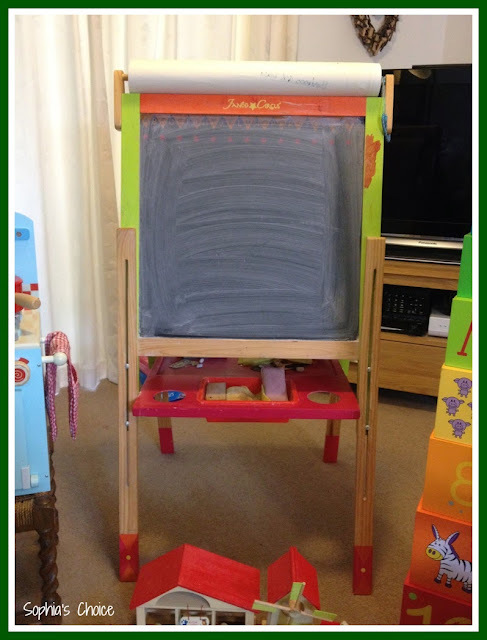 Norovirus and the like take hold and last November/December time poor Sophia was struck down by one such stomach bug, which recurrently had her off school for a period of 4 weeks. As soon as we thought it had gone, it reappeared again. It was exhausting and upsetting for Sophia. Vomiting and diarrhea coupled with stomach cramps which would come in waves in the middle of the night meant that we spent many an hour during that period on the sofa downstairs. It certainly wasn’t fun. 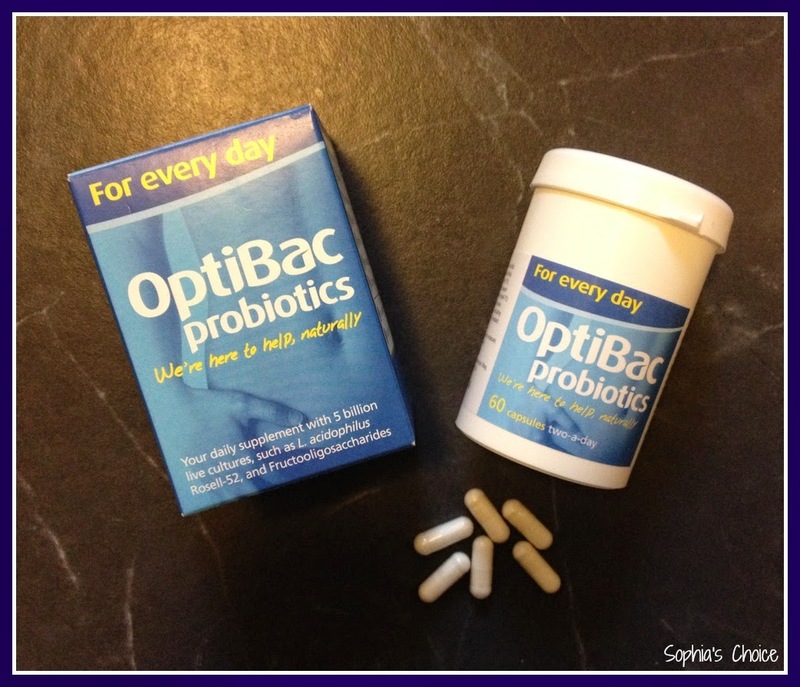 As a family we take probiotics regularly however last year it was a bit more hit and miss. That won’t be happening again this year! The gut houses approximately two thirds of our immune function so it’s really important to support this. When we have antibiotics or we have severe stomach upsets or food poisoning, we can strip our gut of the natural, beneficial bacteria which are needed to keep our immune systems working properly. Lack of these beneficial bacterium can also lead to conditions like candida. Keen to try to get on top of this particular bought of sickness, I sent out an SOS tweet on Twitter, and Optibac were one of the companies that came to my rescue (Organic Burst were another). They recommended that I try Sophia on Saccharomyces Boulardii. They kindly sent me a pack to try and within about 48 hours Sophia was greatly improved. We had her on them for about a week and supported this with a daily wellbeing probiotic afterwards. It did the trick and we finally managed to repopulate Sophia’s gut again. Phew! Then back in August this year my husband and I were struck down by food poisoning. What was supposed to be a lovely end to our summer holiday turned into an absolute nightmare ! I’ve had stomach bugs and the norovirus before and that was bad enough but never had either of us suffered food poisoning and I hope we never will again. The culprit was of course chicken – it always is isn’t it?! From our local Chinese takeaway. We’ve never ever had any issues before but when I tasted a strip of this particular dish I thought, “I don’t like the taste of this; I’m not having anymore”. However, that was all I needed to be hugging the loo 5 hours later along with my hubby. 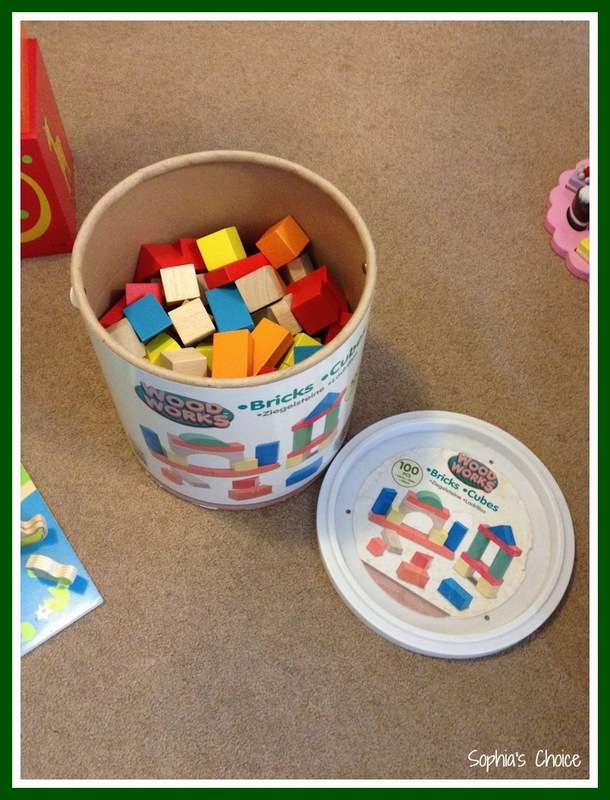 Good job we have 2 loos in our house! We were both wiped out for 48 hours and my eldest Sophia was amazing helping with Jess; getting her breakfast and lunch, helping her get dressed etc. She was a star. Thank goodness Jess wasn’t a baby or we’d have really struggled. Your health is everything isn’t it? Anyway, it has taken me a good 6 weeks to feel better again and Optibac’s Saccharomyces Boulardii was one of the products I reached for first to help me get back on my feet. I also put myself on their daily wellbeing probiotics too. In addition, I have been using A Vogel’s Molkosan Fruit Prebiotic to encourage the growth of all those good guys in my gut again. 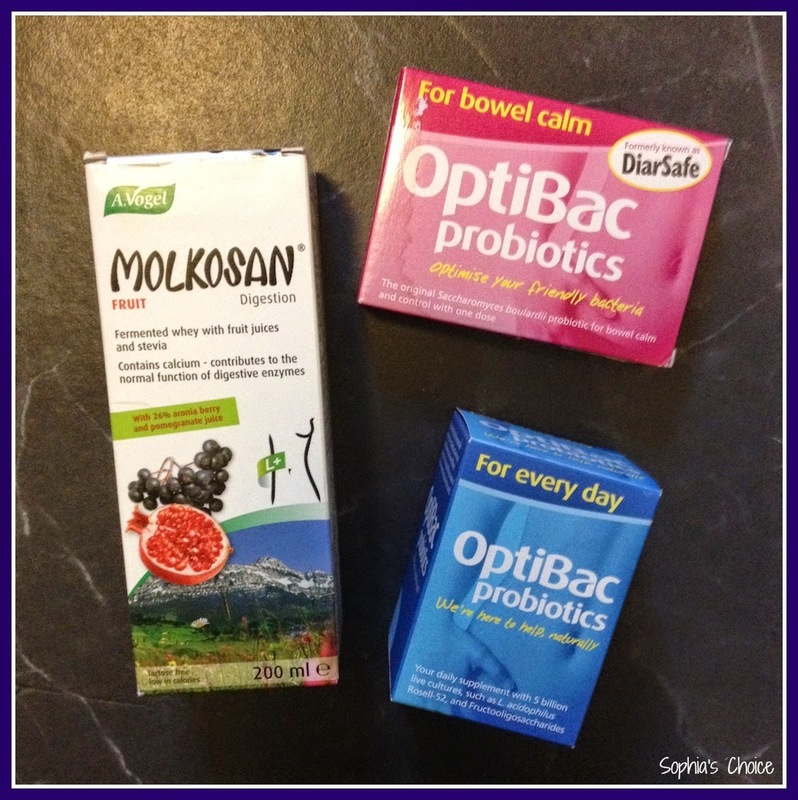 A prebiotic such as Molkosan is a source of food for probiotics to grow, multiply and survive in the gut. Theirs is fermented whey with fruit juices, stevia and calcium. “Prebiotics are fibres which cannot be absorbed or broken down by the body and therefore serve as a great food source for probiotics, in particular the Bifidobacteria genus, to increase in numbers. Prebiotics by nature do not stimulate the growth of bad bacteria or other pathogens; the official definition of prebiotics is: ‘non-digestible food ingredients that beneficially affect the host by selectively stimulating the growth and/or activity of one or a limited number of bacteria in the colon, which can improve host health’." A Vogel kindly sent me a bottle to try out for review a few months back and I’m so pleased that I hadn’t tried it out sooner as it has been the perfect accompaniment to my probiotics in getting my gut back on track. You put 20ml in a small glass of water and take it for at least 7 days in a row. It tastes a bit like the children’s Yeo Valley probiotic yoghurts. I like it and it has certainly made a difference for me over the past few weeks. You can also get Molkosan Original and Molkosan Vitality. I use our probiotics in smoothies for the girls and I happily take them as capsules or in smoothies myself. We are stocked up for this winter and I’m determined to really support our gut health this time. Reducing sugar in the diet is also important as this suppresses our body’s immune function. I thought I’d have a go at fermented foods this year; sauerkraut being my first to try. I’ll have to report back on how well I do. There are many brands of pre and probiotics on the market to choose from now. You can either buy online or pop down to your local health food store to get yours. Optibac have a very comprehensive range for all sorts of conditions / situations so well worth checking out and of course A Vogel have their Molkosan range available too. Do any of you use pre or probiotics on a daily basis? Do let me know in the comments section below. I love to hear your thoughts. Make sure you keep your immune system in tip top condition this winter and include your fair share of friendly bacteria in the mix. 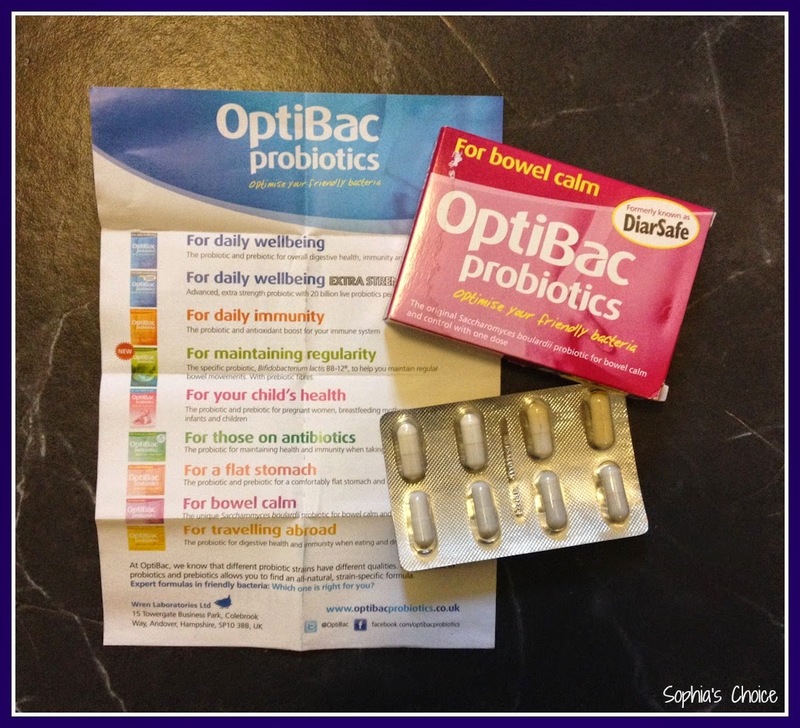 Disclaimer: I was sent some Optibac Saccharomyces Boulardii to try for Sophia when she was poorly last winter. 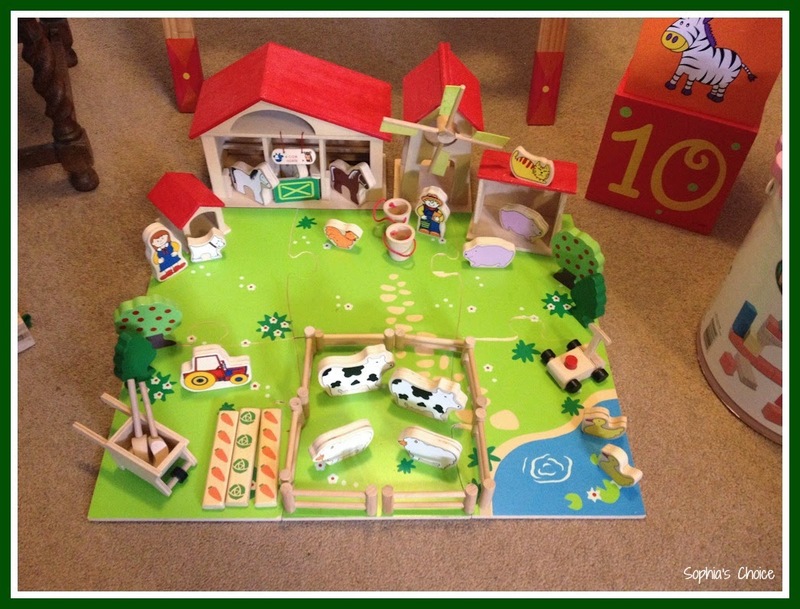 I have decided to share our experience of them on my blog. 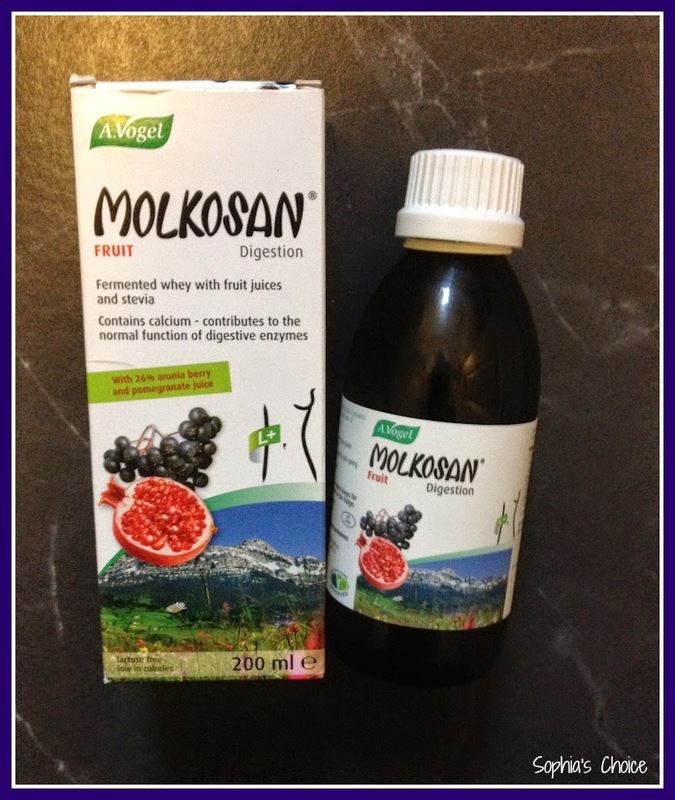 I was also sent a Molkosan Fruit Prebiotic to try out for review on my blog. All thoughts, feeling and opinions are my own. I’m glad I had this in reserve to help my recovery from this bout of food poisoning! It is always advised that you seek independent professional advise about taking supplements particularly if you are suffering with certain health conditions or you are taking certain medications.